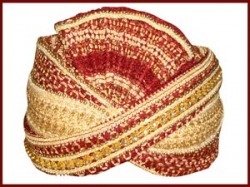 The dress of bridegroom is incomplete without these wedding turbans. it is a traditional Pajami Kurta, shervani or a formal business suit, these caps brings a glow on the face of every bridegroom. In Hindi, a turban is called a pagri or safa. The word "turban" is a common umbrella term used in English to refer to any sort of head wrap regardless of region or culture. The long strip of cloth was soaked in water at a well, and then wrapped around the head. The layers of wet cloth kept wet all day in the hot dry air. The people of the Indian districts of Mysore and Kodagu wear turbans called Mysore peta. Distinguished people are honored by the award of a Mysore peta in a formal ceremony. In Kodagu district people wear it with traditional dress on special occasions such as marriages.